is there any demo Omnia router available on the web so that i can checkout the webif and config possiblities? Or a pictured manual for the router? But there i can not found any screenshots of the webui. Turris Omnia Web Demo available? this video shows only the installation wizzard - not the other menus. I made screenshots for you. I took them on Turris 1.1 router. It is same for Omnia except it has blue colors instead of red. It should be redesigned soon. It is similar like in video, but the video was made 3-4 years ago. So there is little bit progress in design and so on. So LuCi is not running on turris omnia atm? Do you know when it will be available? LuCI is also running on Turris and Turris Omnia. Sorry if it wasn’t clear. I little bit edited my previous post. To make it more clear that Turris is running on OpenWRT (soon on LEDE). 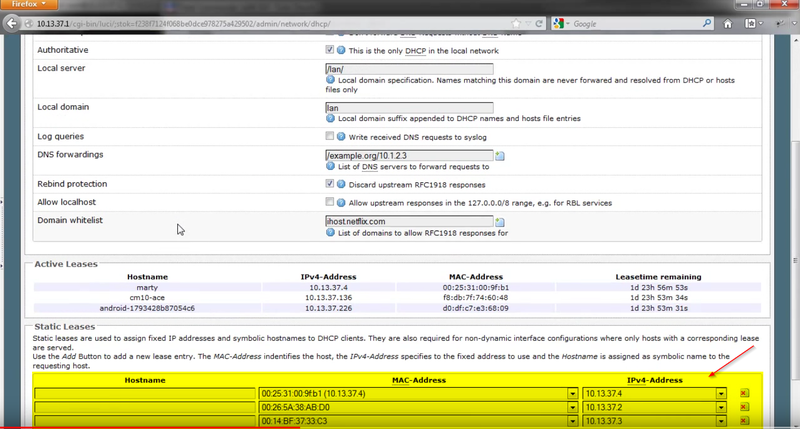 Yeah it is possible to set dhcp entries (mac & ip addreses) in Foris (there only for WAN) or you can use LuCI. do i have the yellow marked inputfields in omnia too? i want to configure dhcp and dns for local hosts in one place. basic administration interface - Foris. It should be resigned soon. Yes, that’s also possible on Turris Omnia, but it’s a little bit tricky. Hi there I have sever computers/devices on my lan. With the Asus RT-AC68U with Merlin and dnsmasq I was able to just ping and access them like "ping computer1". However, with the Turris Omnia I can't neither ping no access them. How can I eanble automatic hostname resolution in the lan (for dhcp devices, for static I can edit the /etc/hosts file). But you can ask here on forum and somebody will help you on that! So on Omnia i will find the basic administration interface shwon on your screenshots AND the LuCi Interface shown on the youtube vid. Correct? I do not care about colors or look and feel. Just want to be sure to have all the configoptions available.